Little is known regarding the effect of bariatric surgery on urinary incontinence. Between September 2008 and November 2014, 240 female patients underwent bariatric surgery. The prevalence of urinary incontinence preoperatively was 45 % (108). Eighty-two (76 %) completed urinary function questionnaires pre-operatively and post-operatively. Fifty-seven (70 %) underwent laparoscopic gastric bypass, twenty-four (29 %) underwent sleeve gastrectomy and one underwent a banding procedure. Thirty-one (38 %) reported leaking on sneezing or coughing—stress urinary incontinence (SUI). Thirteen (16 %) complained of leaking before reaching the toilet—overactive bladder syndrome (OAB). The remaining thirty-eight (46 %) reported mixed symptoms. 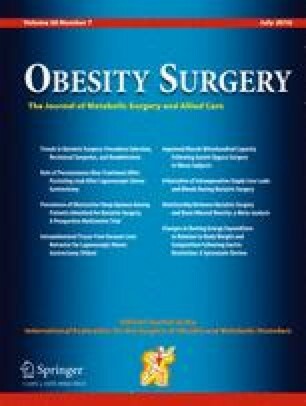 The mean pre-operative weight and BMI were 133 (18) kg and 50 (SD = 6.2) kg/m2 respectively. The mean post-operative BMI drop was 16 (SD = 5.2) kg/m2. Preoperatively, 61 (75 %) reported moderate to very severe urinary incontinence compared to 30 (37 %) post-operatively (χ 2 = 3.24.67, p = 0.050). Twenty-seven (33 %) patients reported complete resolution of their urinary incontinence. Fifty-one (62 %) patients required incontinence pads on a daily basis pre-operatively, compared to 35 (43 %) post-operatively (χ 2 = 22.211.6, p = 0.00). The mean International Consultation on Incontinence Questionnaire- Urinary Incontinence short form (ICIQ-UI SF) score was 9.3 (SD = 4.4) pre-operatively compared to 4.9 (SD = 5.3) post-operatively (t = 7.2, p = 0.000). The improvement score post-operatively was 8 (SD = 3). A significant difference in the ICIQ-UI SF was identified between OAB and SUI groups when adjusting for age, number of children, type of delivery and pre-op BMI (t = 1.98, p = 0.05). Bariatric surgery results in a clinically significant improvement in urinary incontinence. However, this is not proportional to pre-operative BMI, weight loss, age, parity and mode of delivery. Catriona O’Sullivan provided invaluable secretarial support for this project. CJ O’Boyle, OE O’Sullivan, H Shabana and M Boyce have no conflict of interest. BA O’Reilly received educational funding from Astellas and Pfizer.